Come and relax at 2250 m altitude in front of glaciers in an idyllic setting. Enjoy our snacks on the terrace or by appointment discover our typical food : herbal soup, gratins, mursons, pies. From Mizoen – Les Aymes, the path follows the GR50 and GR54 paths (Tour du Dauphiné) that leads up to the refuge of Les Clots (it is also possible to make a detour via the discovery path): take a break and admire the huge Cascade de La Pisse and the view! Then continue the climb, quite steep, up to the plateau where you reach the refuge of Les Mouterres on your right. Le Plateau itself is a little piece of heaven, with a wide variety of alpine flowers during June and July, numerous colonies of marmots near the refuge, grasshoppers, butterflies, dragonflies to the lakes, and also larks, the golden eagle and around sixty vultures recently arrived from the South. Emparis has always been a renowned pasture: the path will then be a good excuse to encounter the shepherds, their dogs and thousands of sheep. 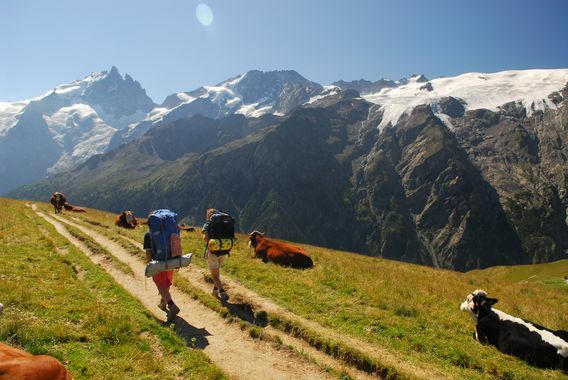 The departure is also possible from Besse-en-Oisans or Le Chazelet, following in both cases the GR54 path. Mountain bikers may also reach the hut by the sheperds’ road (about 15km), which can also be taken by suitable vehicles with dry and clear weather. - Crossing from Mizoen to Besse (height gain: 1100m), 25km of track and road). Picnic to take away: 9 € (with prior booking). If you bring your own meal: 2 €. From Mizoën les Aymes, the path follows the GR50 and GR 54 paths (Tour du Dauphiné) that leads up to the refuge of Les Clots (it is also possible to make a detour via the discovery path): take a break and admire the huge cascade of La Pisse and the view ! Then continue the climb, quite steep, up to the Plateau, where you reach the refuge of Les Mouterres on your right. Le Plateau itself is a little piece of heaven, with a wide variety of alpine flowers during June and July, numerous colonies of marmots near the refuge, grasshopers, butterflies, dragonflies to the lakes, and also larks, the golden eagle, and around sixty vultures recently arrived from the south. Emparis has always been renowned pasture : the path will then be a good excuse to encounter the sheperds, their dogs and thousands of sheep. The departure is also possible from Besse en Oisans or Le Chazelet, following in both cases the GR54 path. Mountain bikers may also reach the hut by the sheperd's road (about 15 km).